Within the last month, two of the Big Four announced that they will no longer be accepting all-male shortlists during the recruitment process. The news comes after the governments mandatory gender pay reporting rules revealed shocking disparages between pay, whilst a government-backed review shamed Britain’s leading companies for using “pitiful and patronizing” excuses to keep women out of top jobs. Although initiatives such as this are admirable, they’re almost useless if they have no backbone. Ensuring they have maximum impact relies upon a 3-pronged approach; a focus on past, present and future. Recognise the problems your company has had in the past and be open and transparent about them. Often companies will attempt to cover up toxic culture by brushing it under the carpet, however in doing so they have far too commonly ended up protecting the perpetrators, whilst leaving the victims to fight their own corner. The truth will always out however and instead of remaining a short-term problem this complacency has left many companies with long-term strife. In owning discrimination, whether that is contained to the hiring process, or permeates the ranks, you allow the company to deal with the problem swiftly… and then move on. In order for a ‘full-disclosure’ policy to work at cleaning up a bad image, you must also have a clear action plan as to how these problems won’t arise again. Strict no-discrimination policies can work, however again they must be continuously checked on. Holding to account hiring managers who fail to hire competent candidates, purely due to their gender should be top of your list. However, to appeal to women in the first place, and to ensure you retain them, companies can’t maintain an ‘old boys club’ mentality. At Goodman Masson, we ensure that our benefits packages are flexible, allowing for everybody’s needs to be catered for, whilst encouraging men to take their allocated paternity leave can drastically affect discriminatory views. Often a problem, a disturbing amount of hiring managers worry women will leave their roles due to pregnancy, however when both genders take an equal amount of leave, discriminating due to this becomes impossible. We all have a responsibility to make sure that in the future, women don’t face unnecessary hurdles in the workplace, hurdles like the fact that, if it was legal, 37% of hiring managers would only hire men. Allowing successful women to be visible, through workshops, networking events and breakfasts is a sure-fire way of encouraging future professionals. 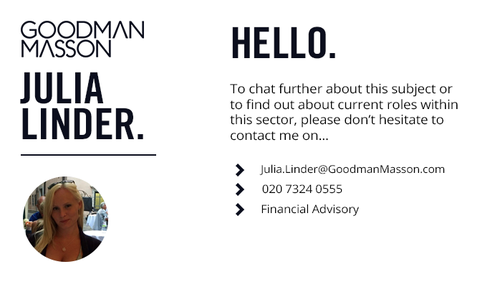 Here at Goodman Masson, we’ve seen an increase in requests for us to set up woman-woman mentoring sessions, and our NTWK: Finance group is thriving. These implementations aren’t just important for the future, but also for ensuring that affirmative action is seen in a positive light in the present. Studies have shown that when women are equally represented, they’re actually viewed as having the majority, something which has caused tension and dissent in the ranks. Only when equality is more common will we move away from the idea that equality for women means discrimination for men.